An extension made to Friedman Memorial Airport’s luggage-screening machine last week allows it to screen oversize items such as ski bags and golf bags. The change from hand-searching those items is expected to speed up the security process as passenger traffic has increased following Delta Air Lines’ switch from 27-seat prop planes to 65-seat jets. The approximately 3-foot-long extensions were added to each end of the machine on Jan. 8, two days after Delta inaugurated its jet service between Sun Valley and Salt Lake City. 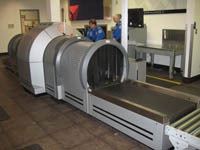 Andrew Coose, federal security director for Idaho, said the Reveal CT-80 checked-baggage screening machine was installed in 2009, after seven years of hand-searching all luggage in response to the Air Transportation Security Act of 2001. However, he said, the Transportation Security Administration was aware at the time that the machine would not be able to screen long items. “We knew that was going to be an issue at Sun Valley because so many people come there for recreation,” he said. However, he said, Friedman had to be placed on a waiting list to get an “extra-long kit” as they became available. Coose said the hand-swiping method used in the meantime often detected traces of nitrates on golf bags due to their use on fertilized golf courses. He said those and other types of false positives for explosives required time-consuming questioning of the items’ owners. He said the Reveal machine detects explosives by measuring the density of items inside the bags, not by searching for traces of explosive materials. “Explosives in bulk amounts are a different density than other items in the bags,” he said. In addition, Coose said, many passengers have expressed discomfort at the invasion of privacy involved in hand searches of their baggage. “It’s going to make things a whole lot easier for our personnel, the airlines and the passengers,” he said of the addition to the machine. “It gives more confidence to the traveling public,” he said. Coose said that of Idaho’s six commercial airports, only one other—at Idaho Falls—has the extended luggage-screening machine. He said the addition was made there due to the airport’s proximity to resorts in the Tetons. Coose said the only commercial airport in the state that has no machine to screen luggage, and must conduct hand searches of all baggage, is at Twin Falls. However, he pointed out, passengers using that airport when their departing flight out of Sun Valley was diverted in bad weather go through the security process at Friedman before they board a bus for Twin Falls. According to the TSA, about 200 airports in the U.S. use the CT-80 baggage-screening units. Of those, about 35 have the extra-long extension.